Great Quality! Great Prices! Great Trailers! 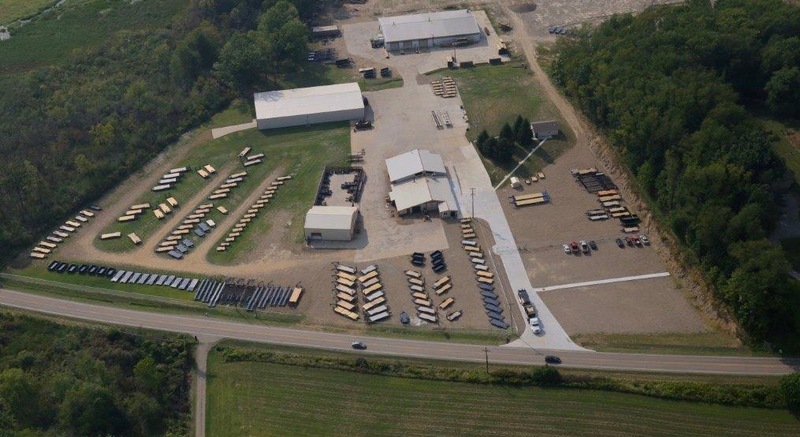 Appalachian Trailers – Ohio and Pennsylvania Locations. 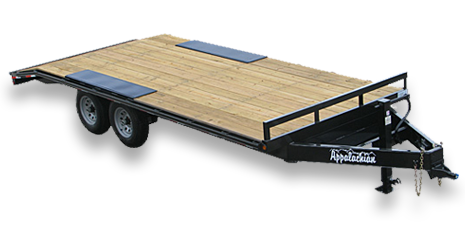 Appalachian Trailers manufactures high quality utility trailers, dump trailers, gooseneck trailers, equipment trailers, and car trailers! Our trailers are available for immediate pick-up. We stock them at both our Ohio and Pennsylvania locations. Appalachian Trailers was founded in the beautiful rolling farm country of Northeast Ohio in 1994. In 2003, we added our Manheim, Pennsylvania sales facility. This location is an easy drive of thirty minutes from Harrisburg or an hour and twenty minutes from Philadelphia. 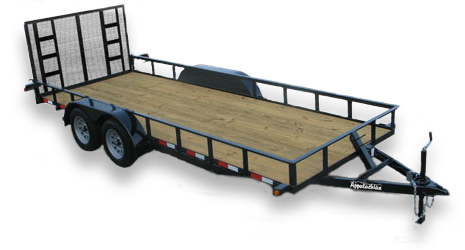 We manufacture industrial grade, durable trailers that are designed with many unique features. Farming, construction, and car hauling are some key industries that use our trailers. Our long lasting and competitively priced Appalachian trailers can be purchased for the same price from either of our locations. Utility Trailers – Our utility trailers are constructed with angle iron frames, angle or tubing top rails, channel tongues, and full width landscape gates that are also made to lay down in the bed for empty transport. These models are available in GVWR’s ranging from 2,900 to 12,000 lb. 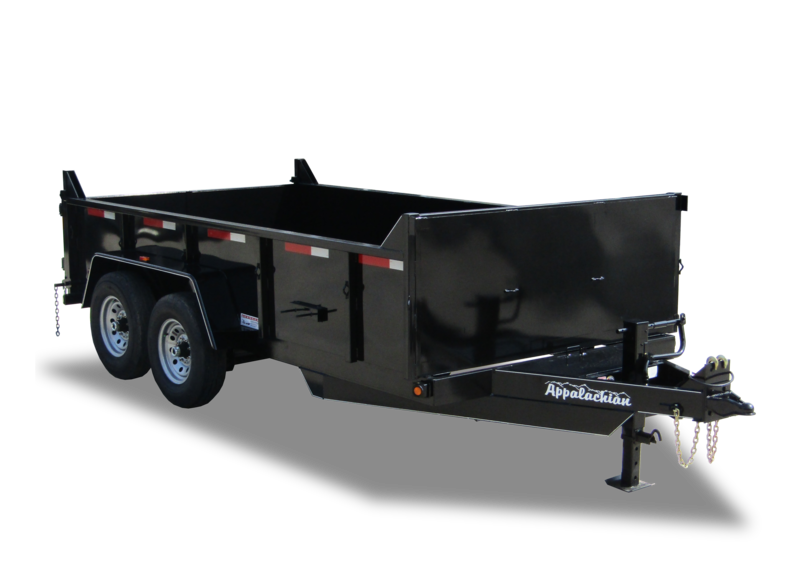 Dump Trailers – Appalachian dump trailers are offered in both tag-a-long and gooseneck hitch models. We manufacture low profile dump trailers with fenders and fixed sides as well as flatbed dump trailers with the deck over the tires. Appalachian Special dump trailers feature drop axles on the low profile line, and our unique American made triple stage cylinders on both the low profile and flatbed dump trailer versions. Gooseneck Trailers – Our rugged gooseneck trailers are built with I-beam and channel iron frames in GVWR’s ranging from 10,000 to 25,000 lb. This line is available in a wide variety of models and configurations. Our standard duty gooseneck trailers are cost effective, yet well equipped. Our contractor grade line is built with heavy-duty frames and many great features. 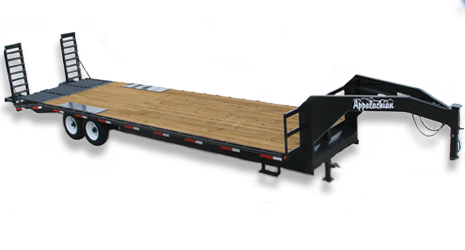 We also offer flatbed tilt gooseneck trailers that load equipment with out ramps. Equipment Trailers – Appalachian’s equipment trailer family features both the skid steer style trailers as well as traditional channel iron frame equipment trailers. Appalachian’s skid steer trailers feature drop axles for a low, easy to load, deck height. Our pintle pull deckover equipment trailers feature all channel iron frames. We also sell tilt bed equipment trailers that are available with hydraulic tilt action or gravity tilt. The Appalachian contractor grade line is built to last and is a great long term investment. 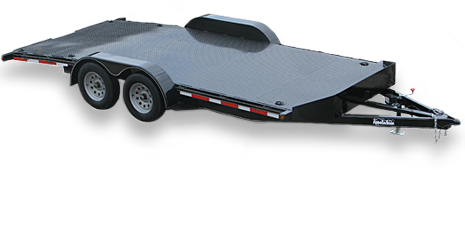 Car Trailers – Appalachian Trailers builds a complete lineup of car trailer models that are capable of hauling from one to four cars. Our car trailers feature unique designs. 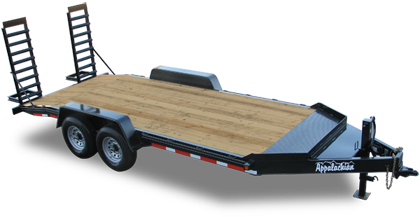 Single car trailers are available in both wood floor and diamond floor models with loading ramps or hydraulic tilt. We have both cost effective channel frame, light and standard duty models, as well as our fancy, all tubing frame, professional grade series. We also feature two car trailer tag-a-long and gooseneck hitch models. Our truck hauling gooseneck car trailer can haul dually pickups or vans with no fender clearance issues. Appalachians double deck, four-car trailer is short and easy to maneuver. Call today, and our friendly sales staff will answer your questions and assist you in the selection of the Appalachian trailer that is perfect for your needs.